Danny Gabbidon made 49 appearances for Wales. 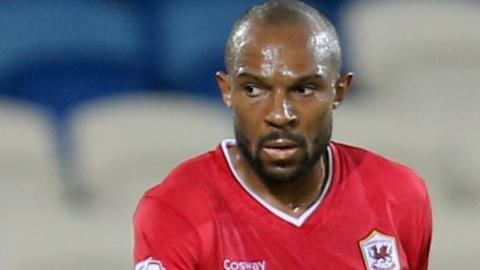 Wales international Danny Gabbidon looks set to end his playing career after deciding against signing for League Two side Leyton Orient. After being released by Cardiff City in June, the 35-year-old trained with Leyton Orient and played in Saturday's 3-0 win over Colchester United. But he has opted to end talks over a potential deal and has suggested that retirement is the next step. "I'm probably concentrating on hanging up the boots," he said. "I'll see how I feel about over the next couple of weeks. I'm still a bit confused about what I want to do. "I'll make a decision in the next week or two." Gabbidon rejoined the Bluebirds as a player-coach on a one-year deal in June 2014 after being released by Crystal Palace. He made only two appearances and was briefly co-caretaker manager with Scott Young. Cardiff decided decided not to renew his contract, but Gabbidon said as recently as last month he felt he had as a player. But training with Orient has not gone as well as he would have hoped, and feels age is finally catching up as he nears his 36th birthday in August. "I was thinking about carrying on playing," said Gabbidon, who played for American MLS side Chicago Fire in a friendly in February as he searched for a new club. "I was training with Leyton Orient and played a couple of games there so I was thinking about going there. "But that's not going to be the case now so I'm deciding again now what I'm going to do. "We were in talks about a deal but it didn't feel right going any further with it. "I didn't feel my body was in the right shape and didn't think it was the right thing to do. Sometimes you just know how you're supposed to feel so I thought the best thing to do was to say 'no' to that."